The fun education snuck into this simple, sun-powered DIY kit helps kids fall in love with STEM. 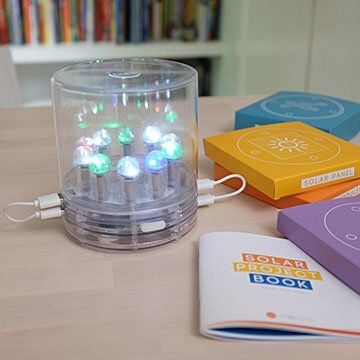 This simple, sun-harnessing DIY kit, by fellow B-Corp MPOWERD, helps kids fall in love with STEM. Just a handful of very easy steps, and ta-da! Their lamp lights up. Once they see the impressively bright results of powering their panel up with sunlight, they'll be sold on the magic of solar power. It comes with clear instructions with plenty of helpful visuals, plus a lot of fun education. Each chapter focuses on a core concept that makes the lamp work. Kids follow along with the inventors and scientists as they make their discoveries, tracing how we got to now. A lifelong passion for science may well be a side effect. Kit includes three modular disks, a transparent cover, two USB cables, LEDs, and booklet. Sun not included. Designed in Brooklyn, New York. Made in China.